As the riding season comes to a close and you clean your ride one last time before hanging it up for the winter, your involvement with the Club – and cycling in general – does not have to be set aside until Spring, too. There is talk that some sort of off-the-bike training program will being to fill that gap between the last days of Fall and the first days of Spring. Club involvement – What can I do to help? 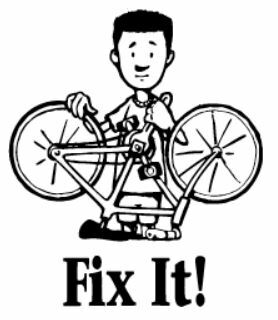 Training on basic bike maintenance, including changing a flat tire, lubing a chain, adjusting brakes, etc. Trail riding vs. Road riding – What’s the difference? Without checking the calendar and scheduling the time, that’s about eight sessions, more or less. I want to gauge interest before I move forward with this, so I’d like some feedback from the membership. The sessions will be held in the conference room of my company (the office is across from the Christian Hilton, not too far from the Performance Bikes store in Newark), which means it is centrally located for most of our members. The sessions will probably run from 6pm – 8pm on a weeknight and will be limited to 10-20 participants, depending on the topic. If you are interested in attending or have some suggestions for topics, please forward an email to me at president@whiteclaybicycleclub.org. I’m also interested in hearing from other members who might be willing to lead a session or help with leading a session. Participation is not only welcomed – it’s encouraged!